This is the story about Norwegian immigrants: A man from "farm Rosvold" and his wife from Østrem who came to America over 100 years ago. Born in Alnes on the island of Godøya in 1880, Lars Kornelius Hansen moved with his parents, Hans and Tidemine, to the Røssevold farm when he was a toddler. He married Olivie Marie Olsdatter in 1900. Olivie, born 24 January 1878, was the daughter of 52 year old Ole Gundersen and Ingeborg Martinusdatter Østrem. When Lars and Olivie decided to move to North America they already were parents of two children and Olivia was pregnant with the third. These children were born at the Røssevold farm. On 18 March 1903 Lars departed from Liverpool aboard the Celtic (White Star Line) arriving in New York on March 28. His destination was noted on the ship's manifest, Mayville, North Dakota. Lars was going to the home of a friend, Elias Rosvold. Another passenger, Nils Petersen, Aalesund, age 17 was also going to Mayville. They could keep each other company on the long trip west. A third passenger, Kornelius Ragnvold Østrem, an 18 year old blacksmith was heading for Tacoma Washington. On November 3, 1904, Olivie, accompanied by four year old Hans and two year old Ingeborg arrived in New York aboard the Cedric. They were joining Lars Rosvold in North Dakota, a train journey of 1400 miles (2400 Km). Conspicuously absent from the ship's manifest was the one year old Lilly who had been born with one arm ending just below the elbow. Olivie was heartbroken to leave Lily with her paternal grandparents in Norway. Lars and Olivia Røssevold and their growing family would remain in North Dakota for eleven years. 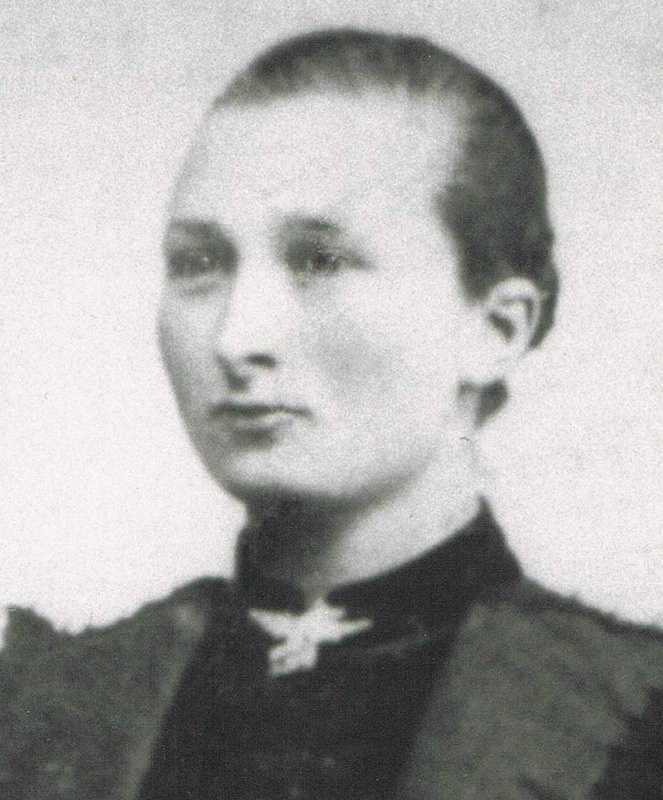 Olivia’s sister, Kornelia Petrine Knutsdatter (b 1884) came to live with them in August 1905. She married in North Dakota and later moved with her husband and children to Minnesota. She died in 1985. Around 1914 many Norwegians in the states of Montana and the Dakotas were migrating north across the Canadian border. By 1921 one third of the Norwegians in Canada had been born in the USA. The Rosvold family moved to Tribune, in south east Saskatchewan in 1915. Markus, born in 1915 died in Eldersley Saskatchewan. And Lloyd, (twins), born in 1920 died in Tisdale Sask in 1986). Lily arrived in Halifax aboard the STAVANGERFJORD from Bergen on Feb 1, 1925. Winter is an inauspicious time to travel across Canada. She took the train from Halifax and met many of her family members for the first time in the little farmhouse on the prairies. She was married in Tribune in 1925 and raised two daughters. She was a gifted seamstress and knitter and sold crochet work to make extra money. The financial collapse in 1929 was accompanied by the Great Depression. On the prairies it was called "the dirty thirties". There was a sustained drought and great dust storms carried away the top soil. Grasshoppers ate whatever vegetation was left. There was no money, the payment for any crops that survived was low, there was no feed for the animals. After 14 years in the Tribune area Lars and Olivia again packed up their family, and like many farmers during this decade moved another three hundred miles north to the community of Elderslie where there was virgin land covered by brush (small bushes) as well as more rain and forests. It was a new frontier. Lily and her family followed a few years later. It was the tendency for many ethnic groups to gather and live in small communities and the Norwegians were no different. They brought their traditions, language and religion with them. Therefore, Lutheran churches would spring up in these areas. Second and even third generation offspring could speak Norwegian. They spoke Norwegian at home and learned English when they went to school. 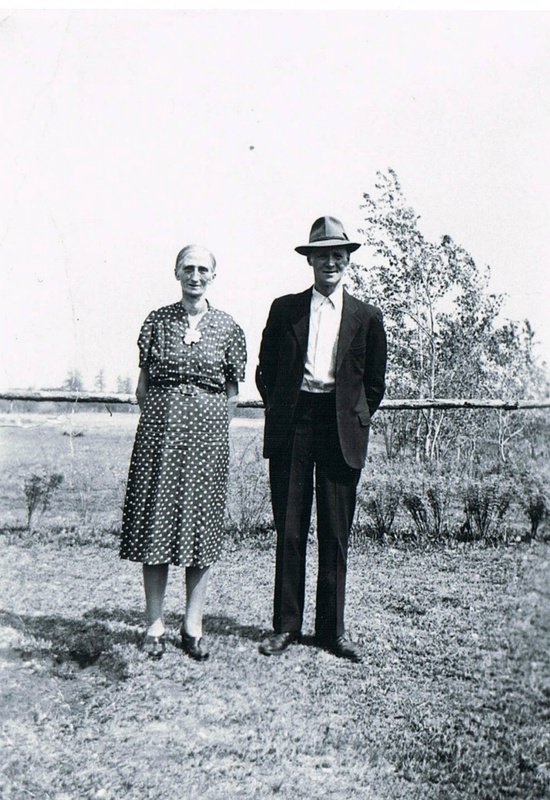 In Elderslie, Saskatchewan Lars and Olivia homesteaded on a small piece of land. Simple wood houses were built on the property for Lars and son Norris and their family. whose parents came from Valdres, met my dad, Harold Rosvold. "We would have starved the first winter if it had not been for the Rosvold's"
Although homes were humble and money was scarce the community had a lot of spirit. There was no Lutheran church in the area so services were held in people's homes. Families tended to be large so there were lots of young people. Everybody was hard up (poor) and they talked about next year with great optimism. Next year things will be better. That is why we call Saskatchewan "next year's country". Norway was referred to as the "old country." As employment was an issue it may have encouraged many young men on the prairies to sign up as volunteers during the Second World War. Three of Lars and Olivia's sons, Ingvar, Lloyd and Harold served in Europe as Canadian soldiers. Hans became a high school mathematics teacher in the US, married and had two sons. He died in Poulsbo, Washington in 1955. Ingeborg died in 1925 and is buried in Tacoma Washington. She was 23 years old, married and had a three year old son. Olivie died in 1942 (64 years old) and is buried in Tisdale Saskatchewan. Her children said she had "the patience of a saint and never complained". Lars eventually moved to Canoe, BC where a number of his sons were working in the forestry industry and spent his remaining years near the mountains. He was buried in British Columbia in 1961. Many of the Rosvold children farmed or worked in the forestry industry. Harold Rosvold, born and raised in Saskatchewan, loved to farm and worked in agriculture until he retired. When he retired he enjoyed spending his winters in the warm climate of Arizona but his summers were spent at his lakeside cabin in Saskatchewan. He loved to golf and fish. Descendants include forty grandchildren, and their children and grandchildren. We are scattered from the Atlantic to the Pacific, from Nova Scotia, Ontario, Saskatchewan, Alberta and British Columbia Canada as well as California and Washington State. I cannot account for everybody but will mention my own siblings, the children of Harold, the youngest. Our brother owns Balarian Arabians in southern Alberta. His son lives in Canmore, Alberta and his daughter lives in Nova Scotia. One sister, a teacher, and her son live in Saskatoon, Saskatchewan. Her daughter is a teacher in Calgary. Cheryl and one son live in Victoria BC. Her other son lives in Calgary. He loves snow, the mountains and the back country and teaches avalanche safety. He first wore skis in Norway when he was six years old. So far there are four grandchildren: Ruby, Ava, Erik and Olivia. This is what happened to one family who left Norway on a hope and a prayer seeking the American dream and a better future for their children. They started their journey in Mayfield, North Dakota where people from Emblem had already established themselves. Therefore, during their first decade in America they were in a community where they already knew people and shared a common background. It was a very different landscape but the people were familiar. Then they helped settle Saskatchewan which had gained the status of a province in 1905. 6.9 % of the population of Saskatchewan is of Norwegian Heritage today. (According to 2011 census). Today when things are ever changing, and relationships fleeting, it gives me comfort that distant relatives still live on the Rosvold farm in Norway, perhaps interacting with people who have been their neighbours for centuries. Thank you for this post. I am also a Rosvold and some of this story sounds familiar. My grandfather was Ames Rosvold and grew up in Saskatchewan also.